A seriously spectacular statement piece, this is the Crown Jewel of my little collection! Smoky quartz colored, tightly woven, handmade Viking Knit chain with amber colored Pandora style beads, forest green glass spacer beads, and bronze wire coil spacers. Freely moving glass bead dangles of amber colored glass "kernels", green glass leaves, and vintage German glass beads. 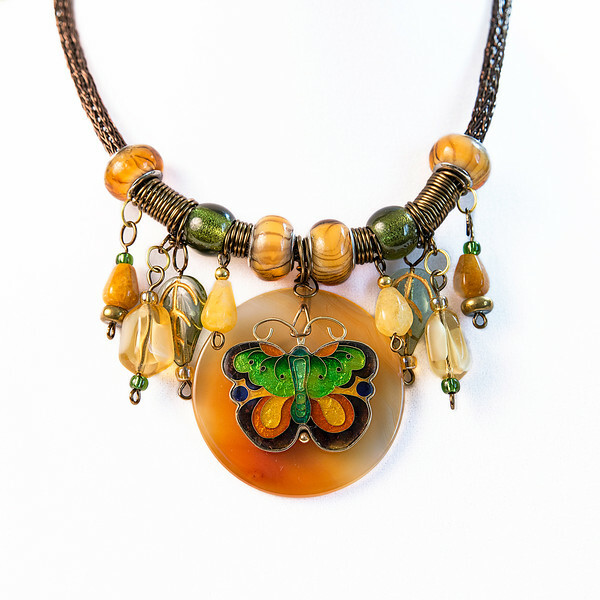 An amber carnelian disc is the backdrop for the stunning Cloisonné butterfly. It's brilliantly colored transparent wings in shades of green, amber, burnt orange, purple and lapis are outlined by 24K gold wire ribbon and set in 14K gold. This is a choker style necklace, measuring approximately 15 inches in length with an extender chain that takes it to 17 inches. Lobster clasp closure.